How do I check my credit points? Login to your account and click on PROFILE. Your credit points are displayed above your name. Upon registering, you should receive 5 FREE credit points. How do I redeem my credit points? When you are ready to check-out, enter the number of credit points you want to use. Don't worry if you use them all, you will get 10% more from your new purchase. How do I get more credit points? Everytime you make a purchase above RM500, you will get 10% worth of credit points from your total purchase (excluding postage and handling fees). In the purchase made in the above example, I will receive 3 credit points that I can redeem next time (since I am in Malaysia). 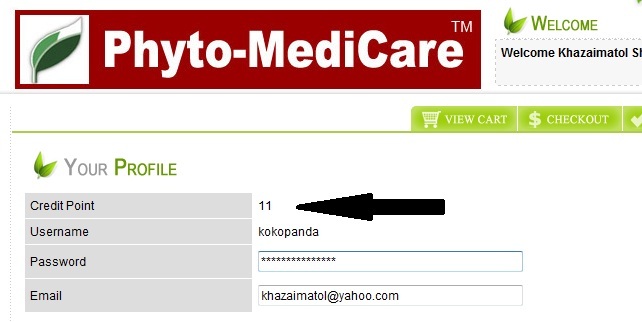 If you have any questions, please email Shima at khazaimatol@yahoo.com or call 012-3055144. **Amount of credit points received back is based on the current promotion. At the moment, all purchases above MYR 500 will receive 10% worth of credit points. All purchases above MYR 2000 will receive 20% credit points. This may change in the future.